Catherine Heard’s work interrogates the histories of science, medicine and the museum. Simultaneously attractive and repulsive, the works delve into primal anxieties about the body. Since 2015, she has been creating sculptures with internal structures that are revealed using medical CT scanners. In these works, Osirix or Horos medical imaging software translates the scans into 2D and 3D simulations and animated sequences: through this process, the sculptures’ concealed interiors become as critical as the external forms. The current exhibition at Birch Contemporary Gallery features Myrllen: A Portrait (2016) and a new body of work, Micrographia (2018). Myrllen: A Portrait was inspired by an elaborately embroidered coat made by a woman who was confined in the Tennessee Eastern State Hospital in the 1940s. The sculpture of a head and brain is constructed from hundreds of layers of antique lace and embroideries of birds and flowers, interspersed with the motif of a falling woman holding a crutch, which is based on one of Myrllen’s embroidered images. 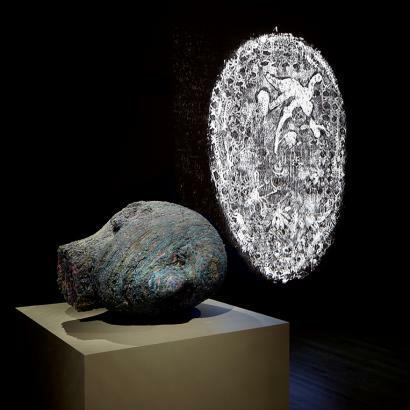 The embroideries and lace concealed inside the skull are revealed using a CT scanner and Osirix Medical Imaging software, which transforms the sewn imagery into a flickering, animation evoking fleeting vignettes. Heard’s newest body of work, Micrographia, is a meditation on the history of microscopy, inspired by Robert Hooke’s 1665 text, Micrographia: or Some Physiological Descriptions of Minute Bodies Made by Magnifying Glasses With Observations and Inquiries Thereupon, and Ernst Haeckel’s 1862 Monograph on Radiolarians. These scientists engaged with microscopy as a cutting-edge technique of their respective eras, creating intricate drawings of the revelations they observed through the lens. Heard reflects on Hooke and Haeckel’s preoccupation with “minute bodies” by constructing miniature sculptures of cellular forms using Japanese paper and materials collected in her garden – seeds, roots and stems. These fibrous materials are treated with an oakgall and iron ink, created from a medieval recipe, which renders them readable by a CT scanner. The scans are translated using Horos medical imaging software, and transformed into mesmerizing videos of rotating orbs, reminiscent of Haeckel’s exquisite engravings of radiolarians (ancient single-celled organisms with mineral skeletons), which he termed, “the most charming creatures”. Micrographia and Radiolarians was created in partnership with the STTARR Innovation Centre, who generously provided CT scanning for the project. Myrllen: A Portrait was produced in partnership with the Art Gallery of Hamilton, St. Joseph’s Healthcare and Dr. Julian Dobranowski, 2016. The Summer Institute of OCAD University supported early stage research for Radiolarians. Special thanks to Dr. Justin Grant, Deborah Scollard, Teesha Komal, Dr. Harley Chan, Darrell Currington, Dr. Julian Dobranowski, Melissa Bennett, Dr. Martin Bourgeois, Alastair Martin, and studio assistants: Ghazal Tehranian, Chad Mohammed, and Bonnie Tung. The artist gratefully acknowledges the support of the Canada Council for the Arts, the Ontario Arts Council, and the Toronto Arts Council.